Dr. Hassan uses the latest techniques in the field of root canal treatment, including the 3D Cone Beam Computer Tomography (CBCT), which is used to produce high-resolution images, and enables him to make more accurate diagnoses and identify the teeth that need to be treated better. In addition, he uses surgical microscope, which is one of the biggest developments in the root canal treatment. 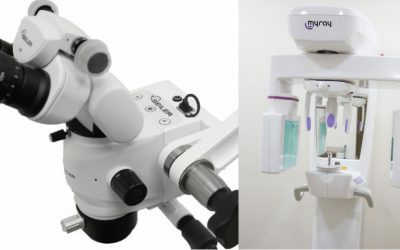 Surgical microscope and microscopic instruments allows the treatment to be more accurate than ever, which means a higher success rate will be achieved in root canal treatment procedures. In addition, we use a special program for dental procedures, where all patient records and treatments are stored on the system. At AbuMaizar Roots Clinic, our goal is to satisfy our patients and to provide the best health care quality and constantly seeking to provide a calm and comfortable therapeutic environment. Will my Tooth Change Color after Root Canal Treatment ? Teeth sometimes turn grey after root canal treatment. This is often a result of the medicated pastes that the dentist uses to clear the infection inside the tooth. For many back teeth, this is not a problem as they are not very visible. For a front tooth, turning grey may not match other front teeth. Ask your dentist about internal bleaching to help restore the tooth’s natural color. Otherwise, a crown or veneer may be needed to mask the color and match the other teeth. 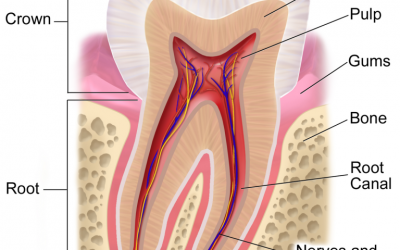 Does Root Canal Weaken The Tooth ? A root canal is an essential procedure that can eliminate infection and save your teeth. But it involves extensive work on the tooth, and some people are concerned that the result might not be strong enough to give long-lasting results. Although a tooth that is treated in a root canal are weakened by decay and by treatment, they are also reinforced so they’re usually strong enough to last for a long time, possibly decades. This doesn’t mean that the tooth is dangerously weakened: the cavity can be narrow and deep, leaving most of the enamel and dentin intact. Other times, though, the tooth might have much of the enamel and dentin removed, putting the tooth at risk for failure. But we don’t leave your tooth weakened. If a significant amount of tooth material had to be removed, we will reinforce the tooth with a metal post. Then the addition of a dental crown will not only protect the tooth from wear, but also brace it against bite forces. The result is a tooth that is as strong or stronger than it was before we began treatment. Is it Better to Pull a Tooth than have Root Canal Treatment ? Pregnancy And Dental Work ? Emergency dental work, such as a root canal or tooth extraction, is necessary. X-rays are necessary to perform many dental procedures, especially emergencies. According to the American College of Radiology, no single diagnostic x-ray has a radiation dose significant enough to cause adverse effects in a developing embryo or fetus. According to the American Dental Association, having dental X-rays during your pregnancy is considered safe with appropriate shielding. Some women may elect to avoid dental work during the first trimester knowing this is the most vulnerable time of development. However, there is no evidence suggesting harm to the baby for those electing to visit the dentist during this time frame. Also, if non-emergency dental work is needed during the third trimester, it is usually postponed until after the birth. This is to avoid the risk of premature labor and prolonged time lying on your back. Taking Antibiotic for Tooth Infection ?